The owner of an American pirate museum claims to be close to finding the remains of Sir Francis Drake, the Elizabethan sailor and navigator. Drake died at sea in 1596 and his body, clad in a full suit of armour and in a lead coffin, is thought to be off the coast of Panama. He was knighted for his successful exploits around the world. Pat Croce claims he has located two ships which were scuttled shortly after Drake died of dysentery. "This is absolutely a dream come true - to find the ships of the most successful pirate in history, who single-handedly wreaked havoc on Spain's New Empire," said Mr Croce, who is blogging on the expedition live from Panama. They are now hoping to find Drake's lead-lined coffin, which may still contain his body, which was reportedly buried in a full suit of armour. Mr Croce said the remains of the ships, the Elizabeth and the Delight, had been discovered at the bottom of Portobelo Bay. Drake is credited for defeating the Spanish Armada's invasion of England in 1588 and also became the first Englishman to circumnavigate the globe. After a career as naval officer, Drake drifted into piracy and was also one of the earliest exponents of the slave trade, bringing African men and women to work in the English colonies of North America in the 16th Century. Mr Croce, who runs the St Augustine Pirate & Treasure Museum in Florida, said they had found the burnt timbers of Elizabeth and Delight, which sank shortly after Drake's death. The team's marine archaeologist, Jim Sinclair, said: "Finding the Elizabeth and Delight near where Sir Francis Drake is buried is as exciting to me as helping discover the (Spanish galleon, Nuestra Senora de) Atocha and diving the RMS Titanic." The expedition focused on Portobelo Bay after hiring London-based researcher Trevor McEniry to pinpoint areas where the ships might have gone down. The Drake expedition once again highlights a grey area when it comes to the protection of British shipwrecks. Under the Protection of Military Remains Act 1986 British naval vessels anywhere in the world are protected from exploitation. But the act only covers certain ships which sunk since 1914 and only British citizens can be prosecuted under it. 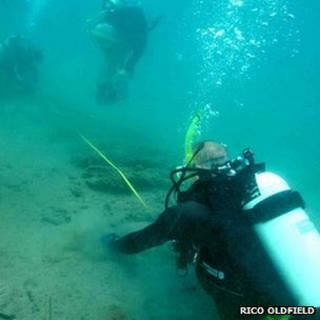 The Joint Nautical Archaeology Policy Committee has been pressing the UK government for years to ratify the Unesco Convention on the Protection of Underwater Cultural Heritage. The JNAPC's chairman, Robert Yorke, told the BBC: "If they are Drake's ships they are presumably sovereign immune so why isn't the British government telling these people to go away? "If we had ratified the convention we could make sure they were properly conserved and looked after." But as Panama has ratified the convention its government might be expected to act to protect the wrecks of the ships.